So I’m going to address the elephunk in room right away. Last night’s come from behind win and this morning’s unveiling of the Heritage Classic jersey have overshadowed a much greater concern surrounding the team. I’m speaking of course about Bobby Ryan’s NOW LEGENDARY slow start. Let’s be the seriousness: Despite the team’s struggles it has been so awesome to be reminded of what it’s like to have someone on the team who lights a mup every other game. Like Karlsson before him guy has silencioed his haterz critics with performance. Now’s the part where I have to say this: I sincerely hope the Senators can make him part of their future so I can buy all the Ryan jerseys. MacArthur / Turris / Ryan 4evR! I’ve been thinking about it and I want to take a minute to clarify some puzzling action that took place last night after some bizarre strategy was employed by Paul MacLean and his boys. Just a theory but I think I’ve figured it out: Instead of using the power play as an opportunity to remain hemmed in their own zone to work on unsuccessful attempts to move the puck through neutral ice, the Senators players fanned out in an umbrella-like formation in the attacking zone and cycled the puck to one another waiting for the most opportune time to shoot. I know, I know, it sounds crazy but the rapid (successful!) passing forced lateral movement from the opposing defenders slyly taking advantage of the fact that the one of the Capitals’ players was serving a penalty and the team had to play shorthanded for two Earth minutes. It was an uncomfortable departure from the team’s at this point all too predictable go to play of springing Chris Phillips so he can go one on one with the goaltender and unleash a top shelf blast over the glove hand (can we talk about how nice that goal was?). Unconventional as it was awesome to see creativity lead to success! In a bit of a confusing move, Paul MacLean has chosen to start Craig Anderson for the second game in as many nights. I mean it worked with Robin Leh–. I don’t know why he is doing this. I didn’t even think Anderson looked particularly good last night despite winning. 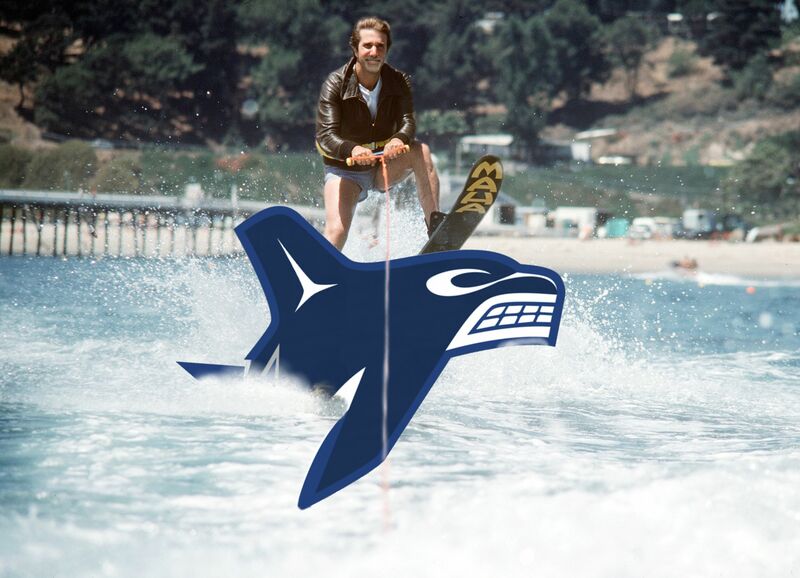 Our beloved Steven (maker of today’s delightful image – Torts looks like Fonzie!) brought up something telling about Andy’s play before the game started last night. He said, “Let’s see if Anderson can stop the first 10 shots of the game. He never seems to be able to do it.” I think his 3rd goal against was on shot 11. Eep. I’ve mentioned numerous times in this still young season that falling behind early is not just on the goalie and that the problem is mostly in the defense but Steve makes a great point. Ya gotta stop those first ten shots. I’m going to be keeping track tonight for sure. Play along at home! Look how beautiful the pass is too. That’s how he do even when a 230 pound dude is about to collide with him. Special Little Guy. After finally getting around to reading letters, emails and tweets from fans Paul MacLean has decided to healthy scratch Jared Cowen for the first time this season. He is also taking out frequent scratch Patrick Wiercioch. I thought Wiercioch was alright last night personally but never the less one game does not excuse the message here. At the start of the year, after each of them signed a new multi year deal. Jared and Patrick were supposed to be the team’s second line pair. So far they’ve seen many partners in attempts to get them going and now they will be partnered up in the press box. Like goaltenders, good defenders take time to develop and both of these guys are very young. They share less than 200 NHL games of experience between the two of them. Still though, frustration with Cowen has been pretty understandable. It’s tough to watch a 6 foot 5 defenseman get bossed around almost nightly. Especially when you add the weight of a new 4 year deal he sat out to get that pays him more than both Marc Methot and Chris Phillips oh and his top 10 draft pedigree. Personally I don’t expect Cowen to turn it around overnight, in fact, I don’t know what to expect period from him right now. One thing I do know is that the Coach has been perplexing in his patience with Cowen and that patience has finally run out. Eric Gryba and Mark Borowiecki (who, if you ask me….ASK ME! has been out-Cowening Cowen since his call up) draw in. Remember that whole Fortress Scotiabank thing last year? Yeah, a huge reason the Sens made the post season was because of how hard they were to beat at home. With a pathetic 4 wins on home ice so far this season, Ottawa needs to start learning to win in Ottawa…Also, y’know, could be a good way to boost ticket sales. Tonight would be a pretty cool time to start taking back the Tire (sorry). As November draws to a close, looking ahead to December 11 of the team’s 15 games will be played at the Tires.com Arena. That’s a make or break schedule. If they can’t take the lion’s share of those games it wont matter if the team doesn’t make the playoffs because they wont deserve to be there anyway. The fact that they played last night is no excuse for not taking this one. I mean it hasn’t stopped a lot of teams from beating us this season. Skilled as Vancouver tends to be this is a team that has won only one regulation game in the past two weeks. I would typically never describe an Ottawa-Vancouver game as totally winnable but you guys this game is totally winnable. I think the Sens should win if for no other reason then none of the canucks can be too happy about that heritage jersey they are going to have to parade around in.